Oh me, oh my. Bad friend alert. Yup, me. My lovely friend Sarah asked me months ago (I don’t even want to know how many!) to make her some cushions for her new apartment. ‘Of course!’ I replied….and here I am, only now getting round to doing them. Uh. Bad friend. Sorry Sarah. However….hope you like them. Originally Sarah had asked me to make her cushions in a similar style to the ones I made for my sister Caroline, with long zips running along the back. Buuut…when I came to find said zips the local sewing shop had decided to stop selling them. Grr. So, off I went home again to find a solution, and I have to say, I’m rather pleased with the results. Sarah chose the main fabric for both cushions and I added a little something from my stash to give them a little more personality. 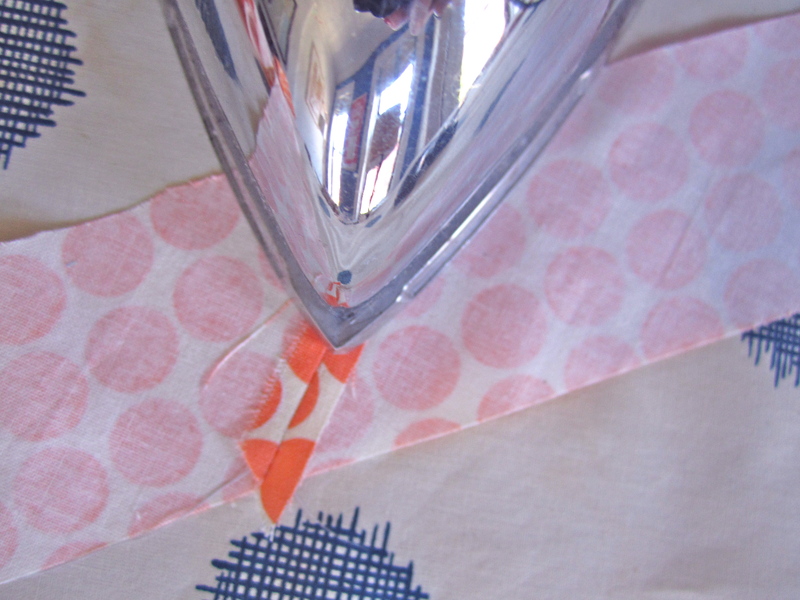 AND….to make up for my tardiness I’ve written a tutorial that you can follow to replicate them in your own home. 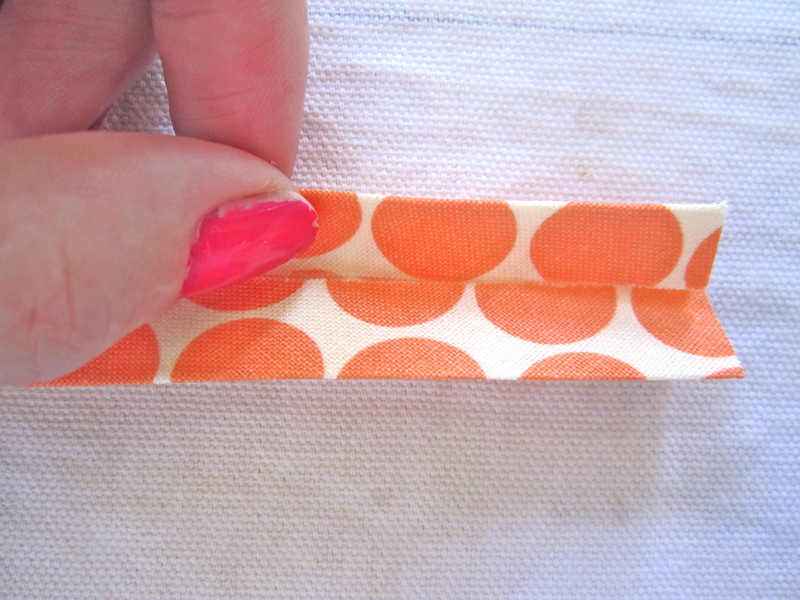 Not only that but this tutorial will be a handy one to keep hold of if you ever want to make your own bias tape. 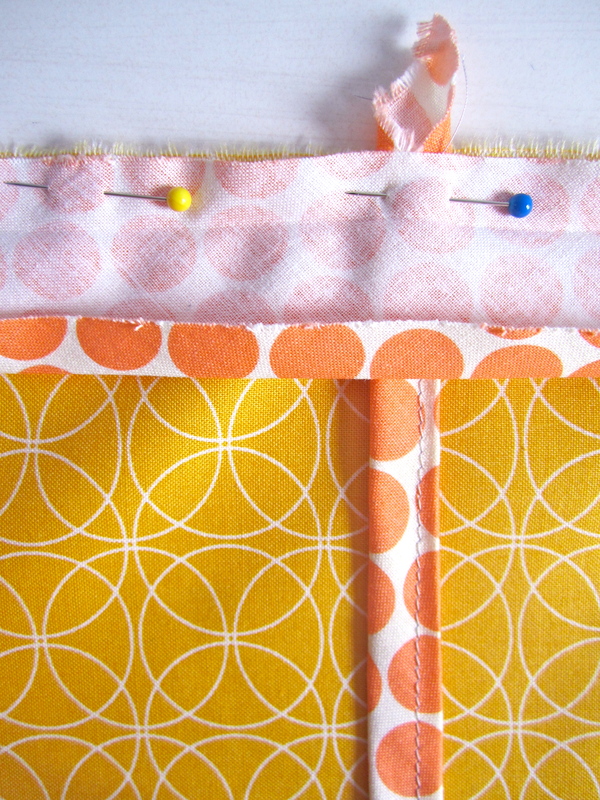 Bias tape is a staple in my sewing drawer. I use it on so many different projects and it can come in really handy even when you’re not expecting it. 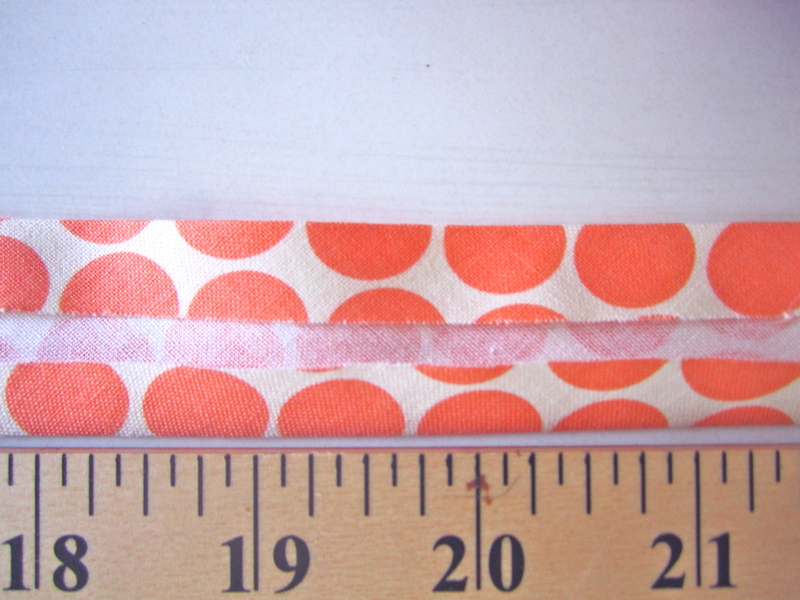 It’s basically a long strip of fabric, folded from both sides into the middle (single fold bias tape) and then folded in half again (double fold bias tape). 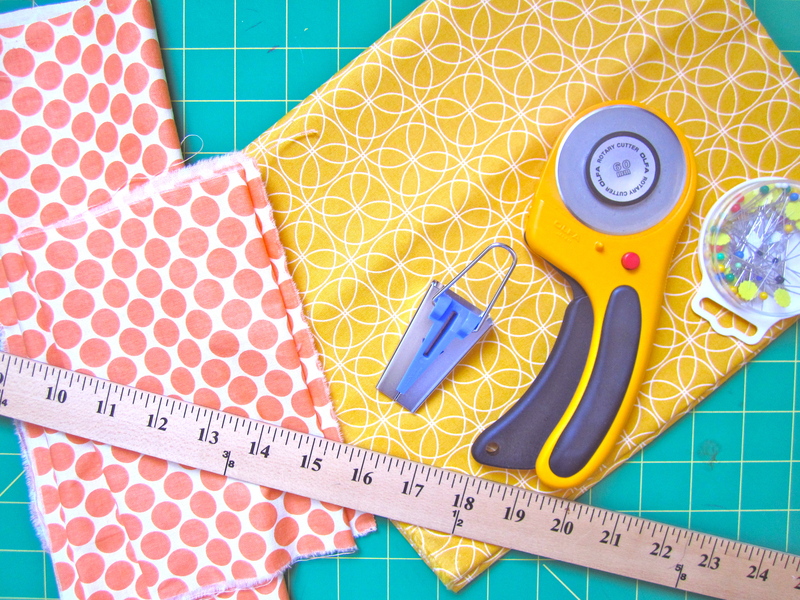 You can buy it in pretty much any sewing shop, probably in the quilting section or near the zips, so don’t feel as though you have to make your own, it’s just nice to know how incase you ever do want to. 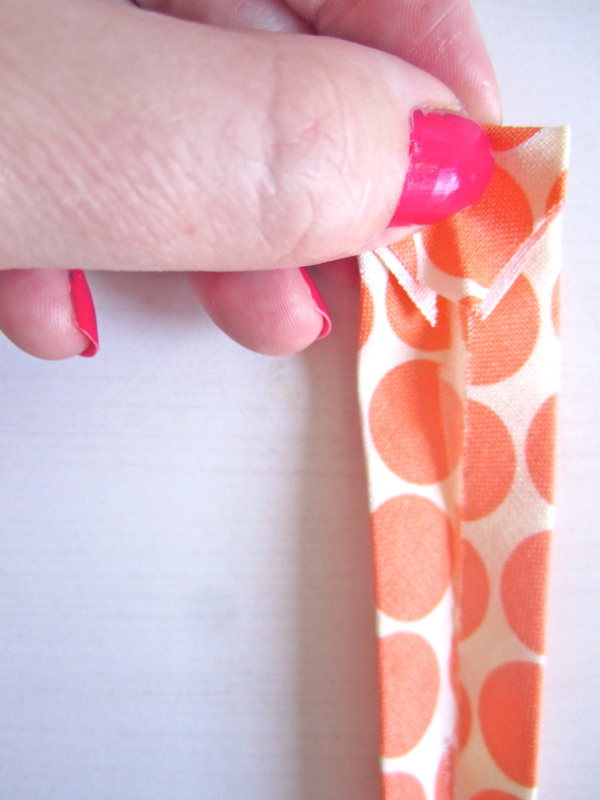 It especially comes in handy if you want it in a particular fabric or print. 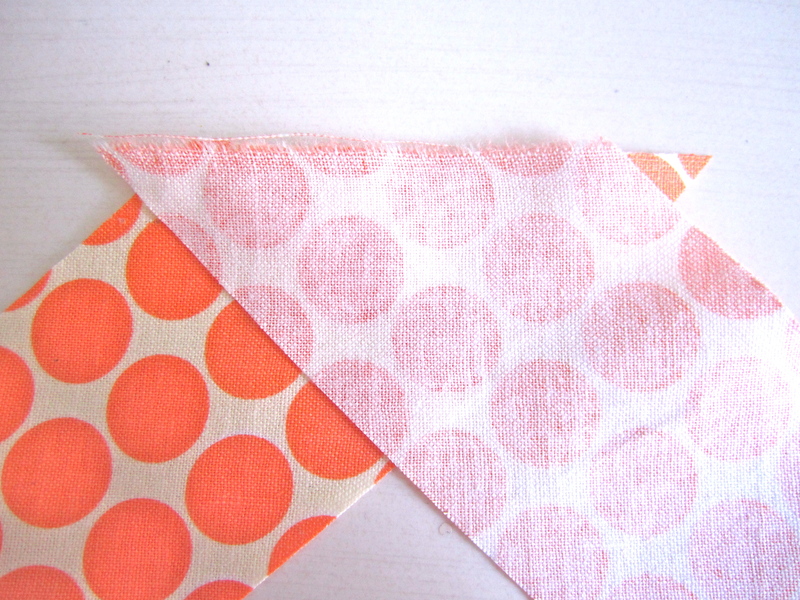 I am new to the bias tape game and made my first for the bunting for the kids room just recently. It’s a slight faff to begin with, but a doddle once you know how. 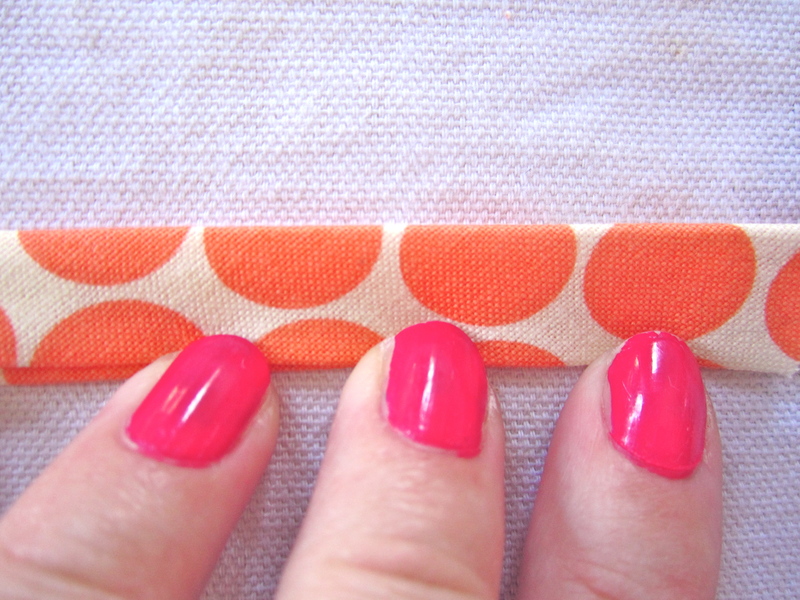 Bias tape is called so because it is made from fabric that has been cut on the bias, at a 45 degree angle to the selvedge edge (the edge of the fabric where the grain runs up and down, left to right). 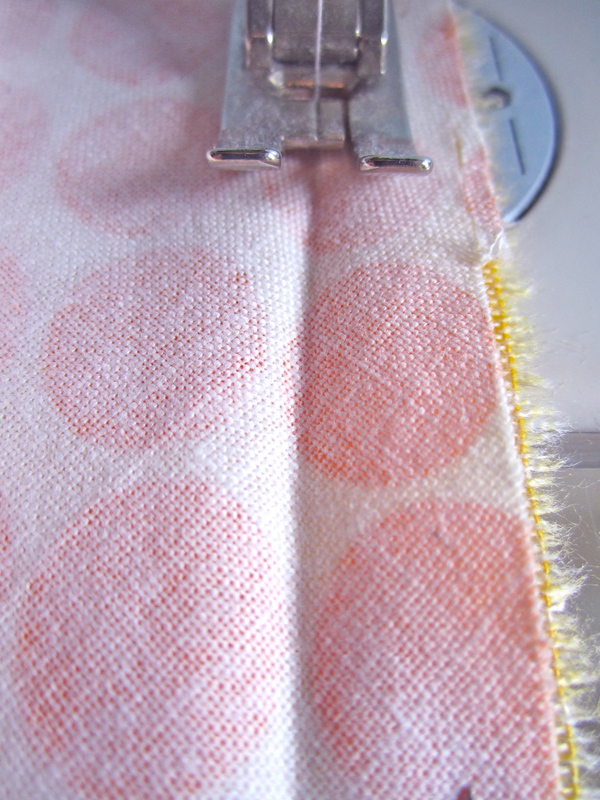 Cutting fabric on the bias gives it a little bit of stretch and allows it to move around corners quite nicely without getting all bunched up. So, get yourself ready for some serious reading and step-following…hopefully it all reads smoothly and makes sense. Finger’s crossed! 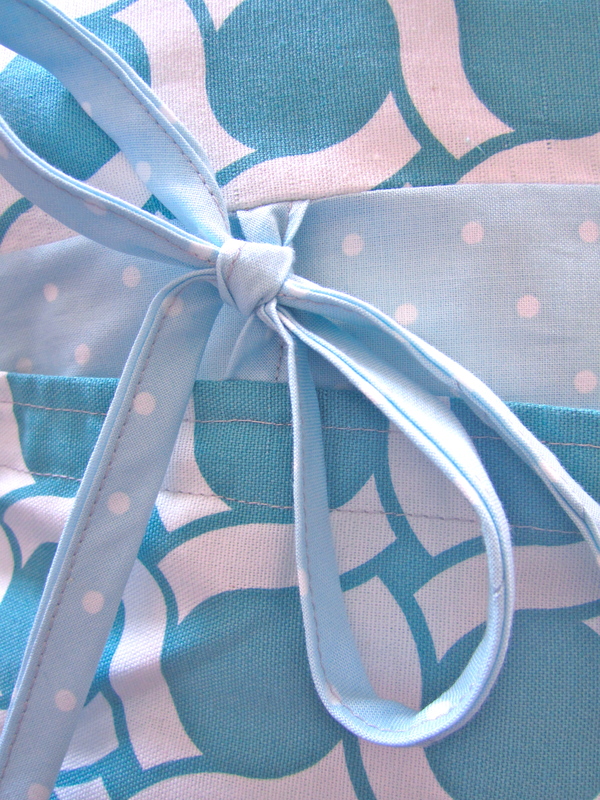 Fabric for your bias tape. 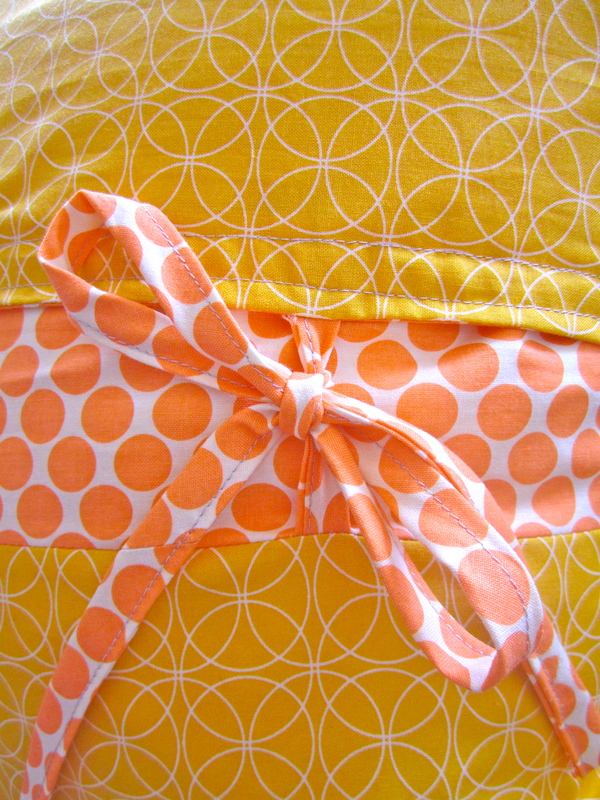 Easiest is to have 1/2 a yard, but I used scraps and just sewed a few together. 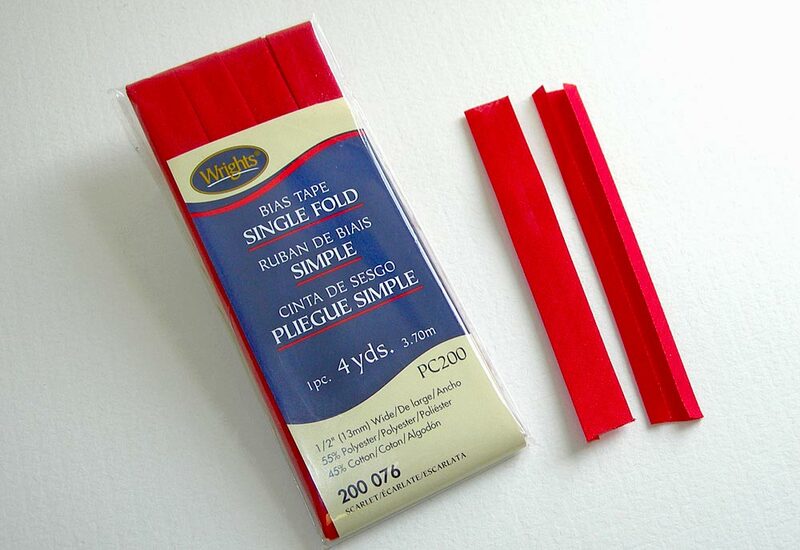 Let’s start with the bias tape. 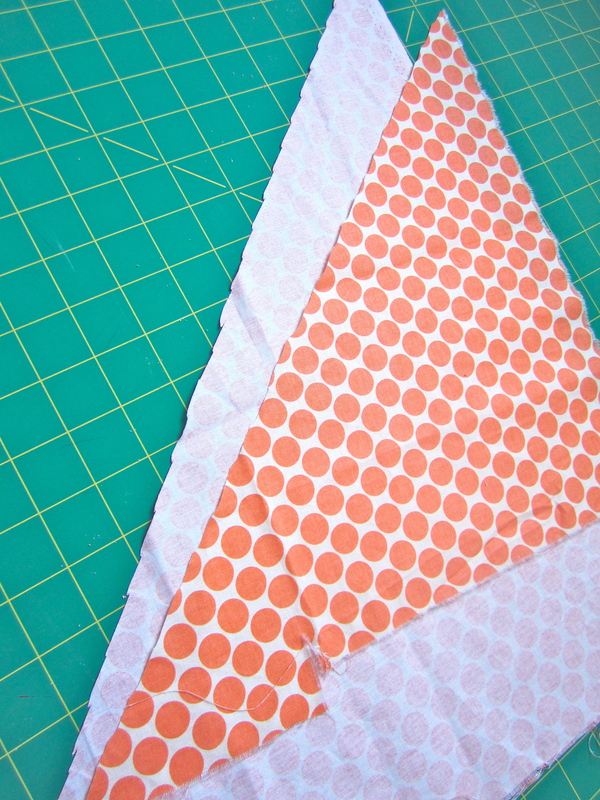 Take your fabric and lay it down on the cutting mat. Take a corner (any corner, you can choose, go wild!) 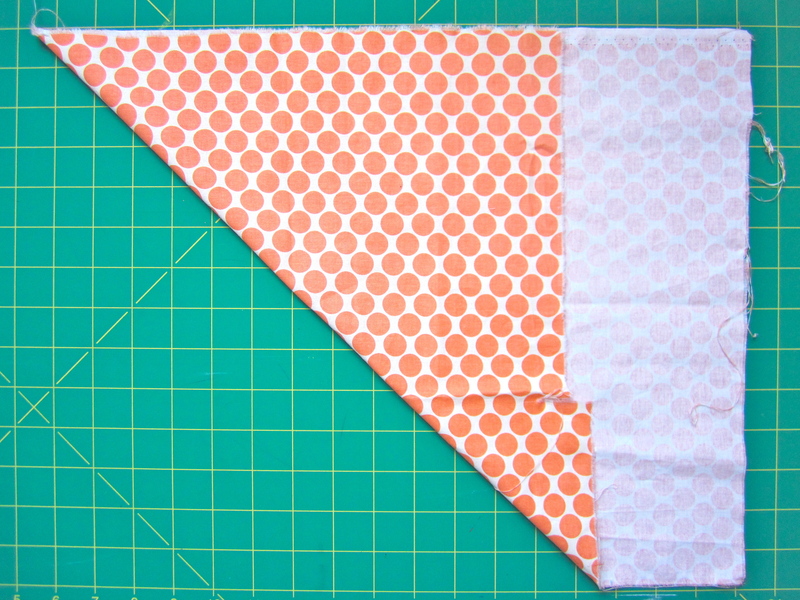 and fold it towards the opposite corner, lining up the straight edges so that you have a triangle. The 45 degree line (the fold) is the bias. Cut along this line as accurately as you can but you don’t need to be too crazy careful about it. 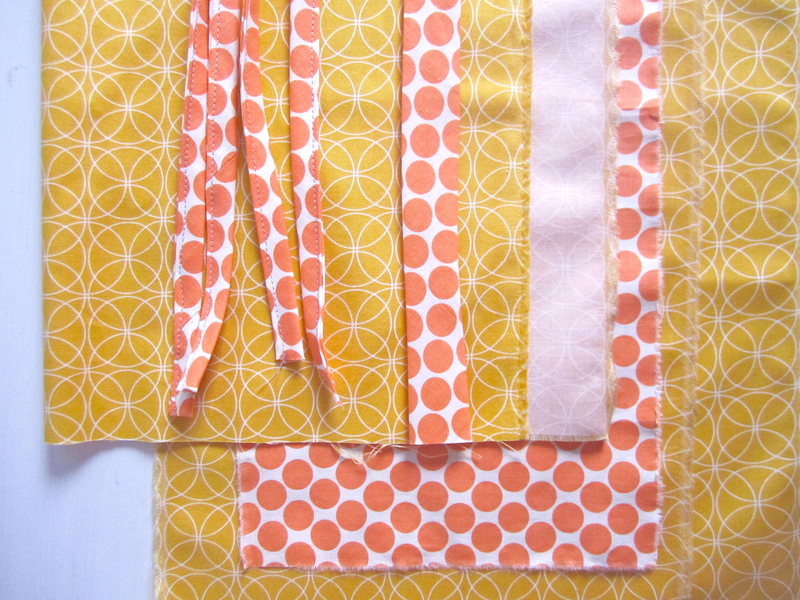 In order to make 1/2 inch double fold bias tape you’ll need to cut 2 inch strips that will be sewn together. You must use the line you just cut as your guide otherwise it simply won’t work. 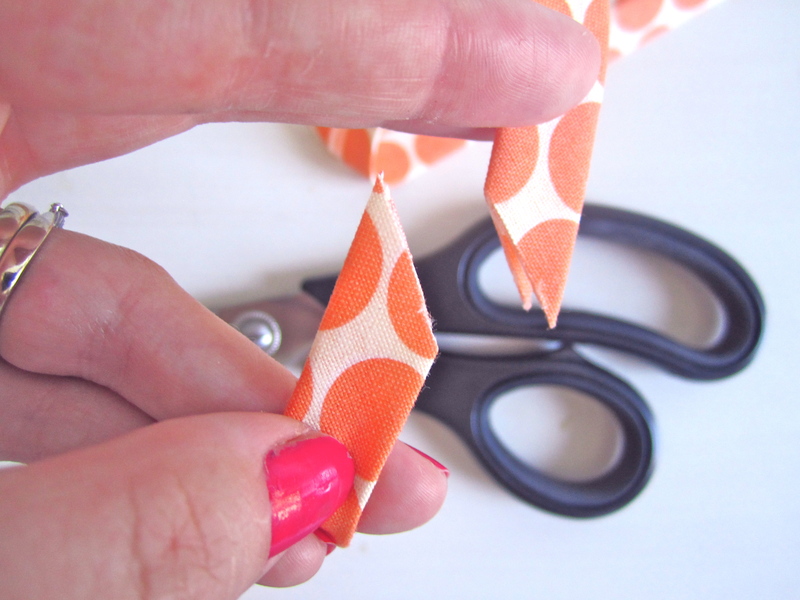 Using your cutting mat (if you have one) cut as many 2 inch strips as you can with the fabric that you have. 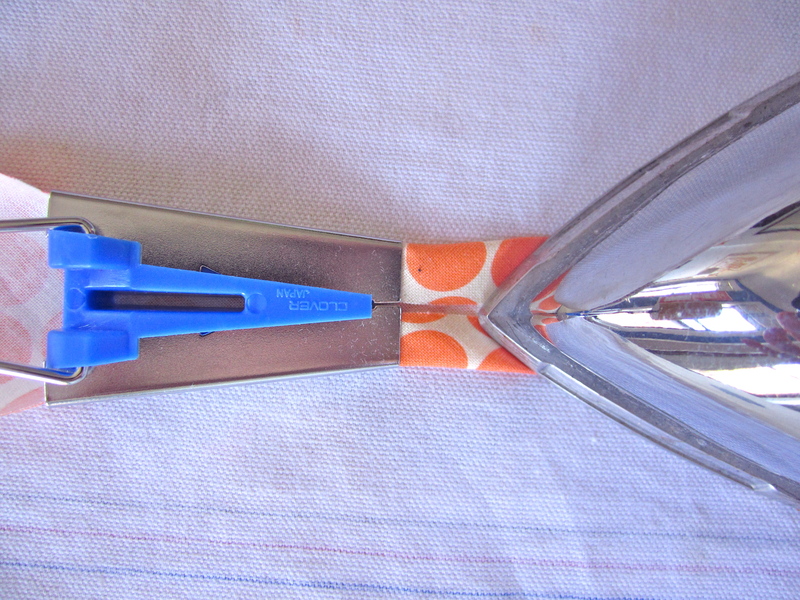 You’ll be left with a number of strips of which each end is not your standard 90 degree angle, but a 45 degree angle. 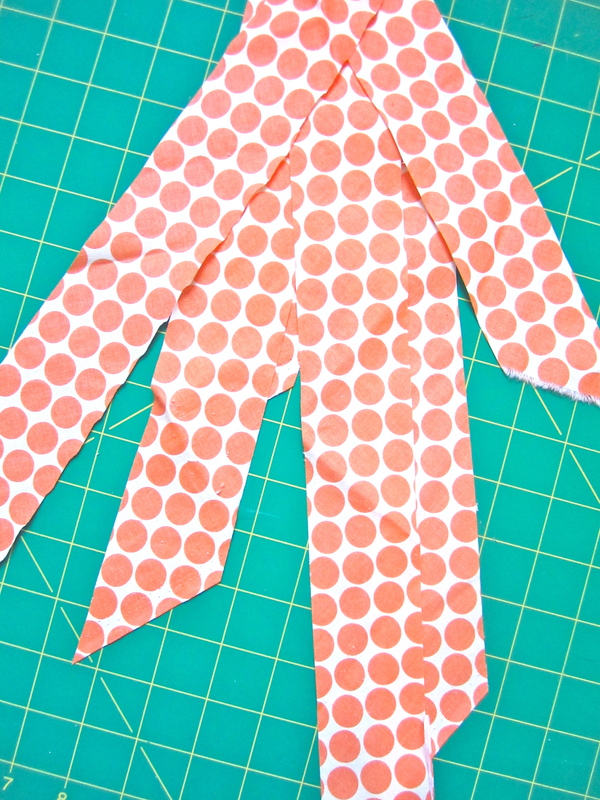 Continue sewing the strips together in this same method until all your strips are sewn in one big continuous line. 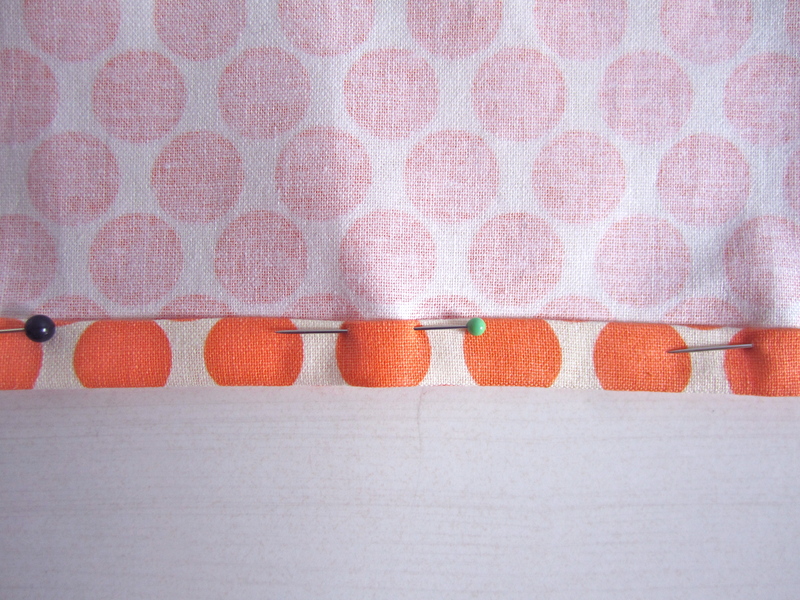 In order to get nice clean bias tape it’s important to clean up as you go along by pressing your seams and snipping off loose ends. 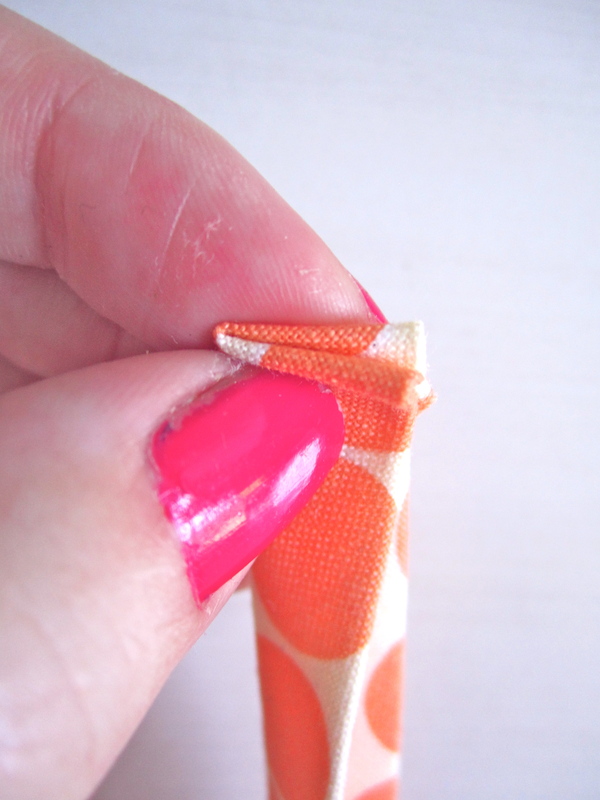 And snip off the ends that are sticking out. 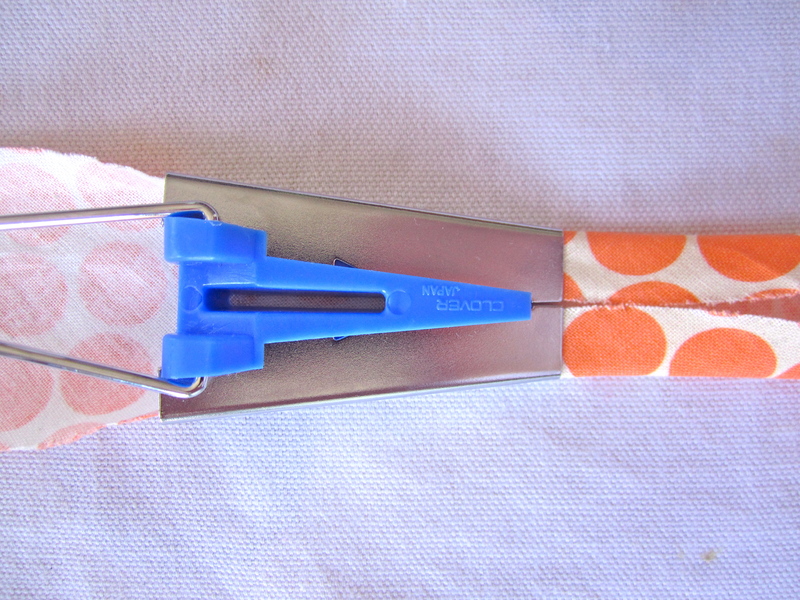 Now to use the fancy bias tape maker! It’s such a tiny piece of equipment but does such a wonderful job! So, thread one end of your long snake of fabric through the thickest part of the machine and shimmy it through until it comes out the other side. 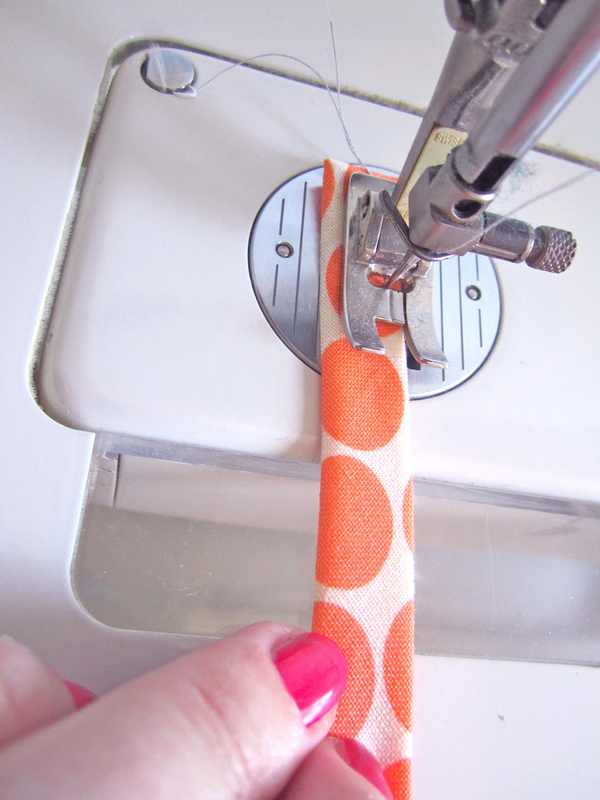 As you pull the fabric through the maker will magically fold both sides in on itself. Hooray! I think we’re all appreciating how much time that has saved us right there! And hey presto! 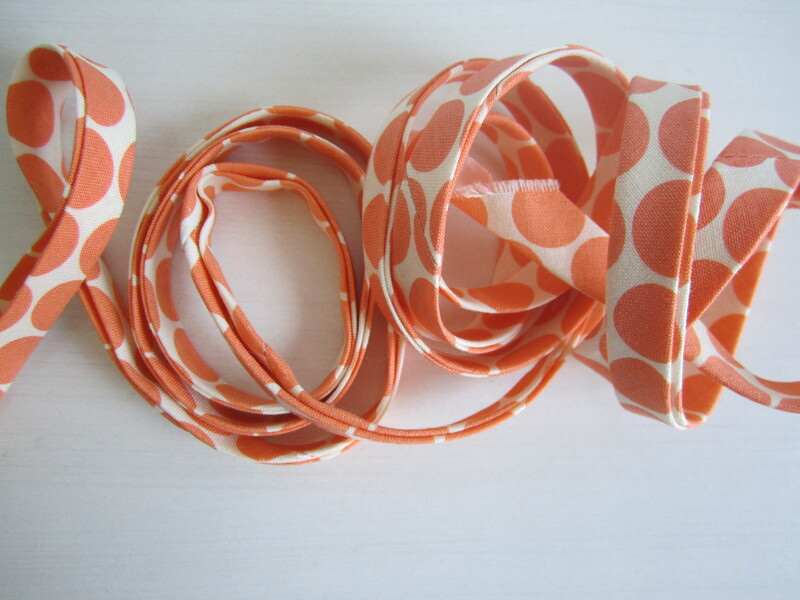 You’ve got yourself some bias tape! Whoop! Repeat the same process for all four ties. We’re going to tackle the side with the ties first. 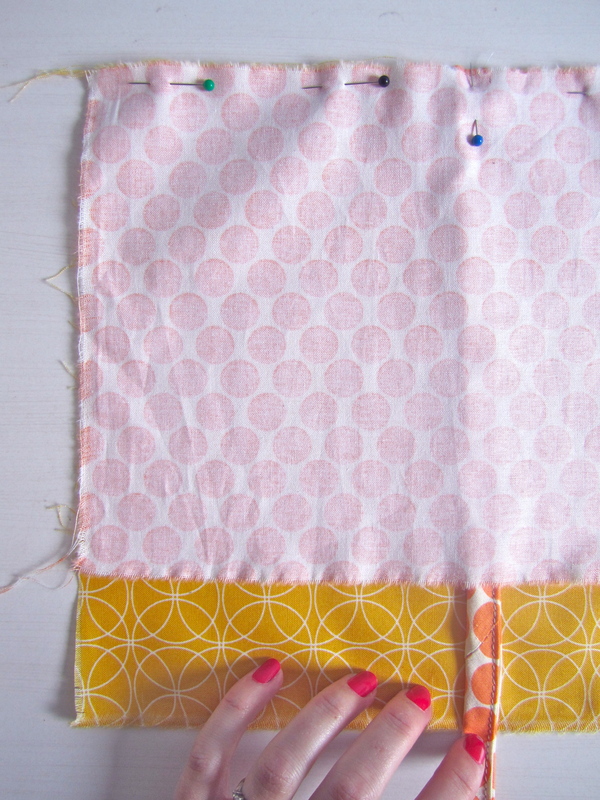 Take one of your rectangles of main fabric, place it right side UP and overlay the one rectangle that you have of the contrasting fabric, right side DOWN. Measure 6 inches in and sandwich a tie in between the two pieces. Pin in place. Repeat for the other side and sew in place. 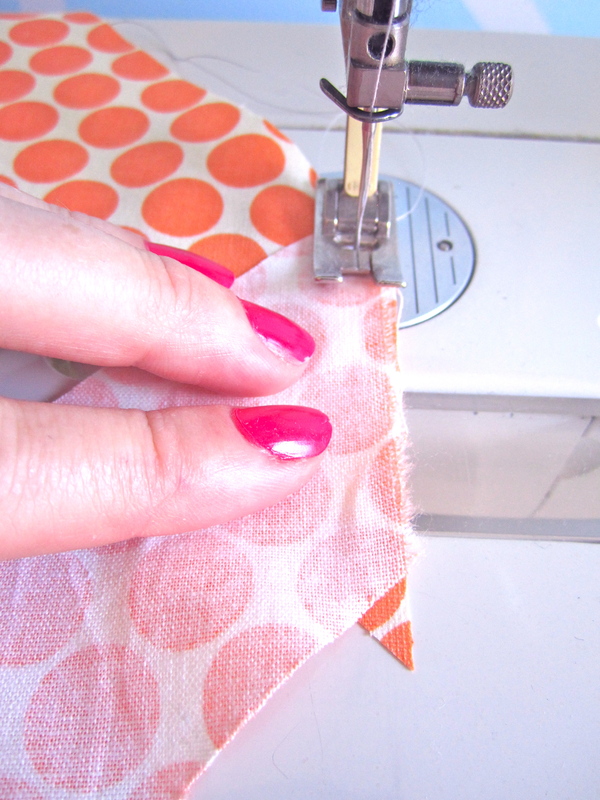 Press your seam. 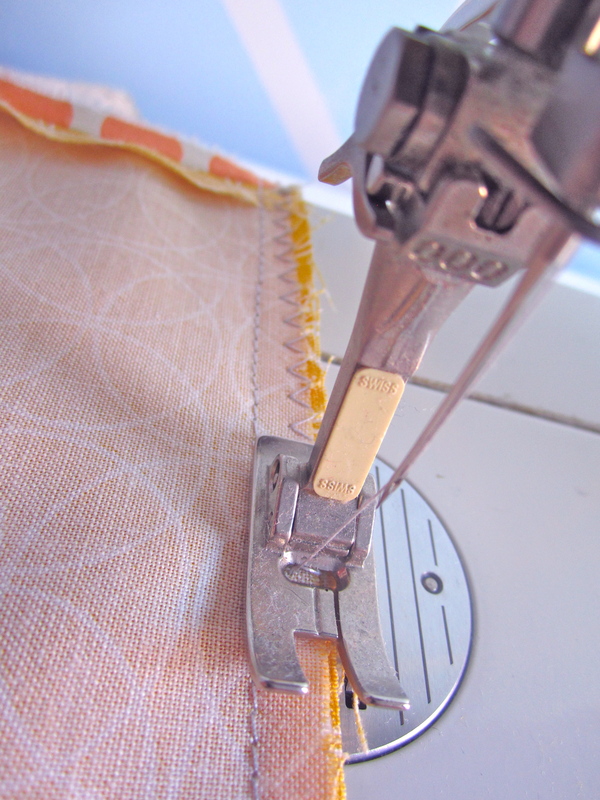 (If you are feeling really super duper, you could zig zag stitch or serge your raw edges before you sew them together). 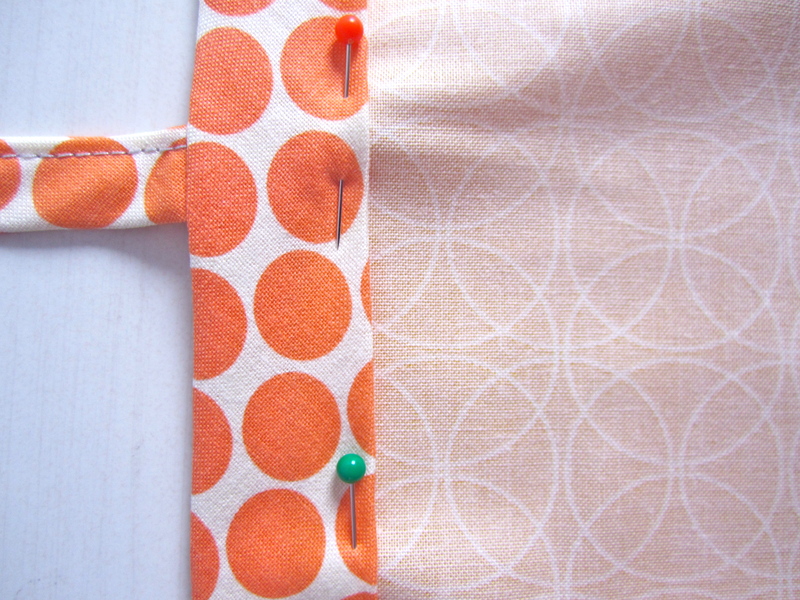 Hem the open end of the contrasting fabric by folding it over on itself twice, pinning and sew in place. Now for the other side. 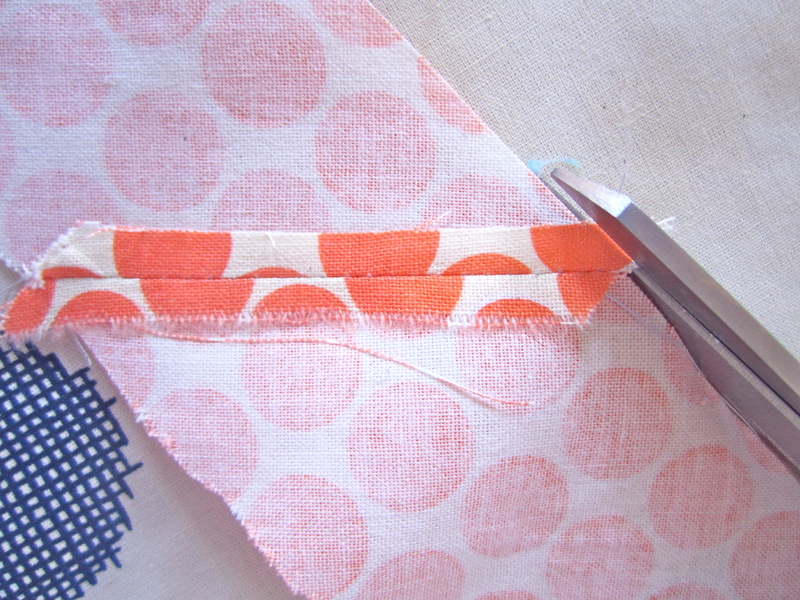 Take the second rectangle of the main fabric, place it right side UP. 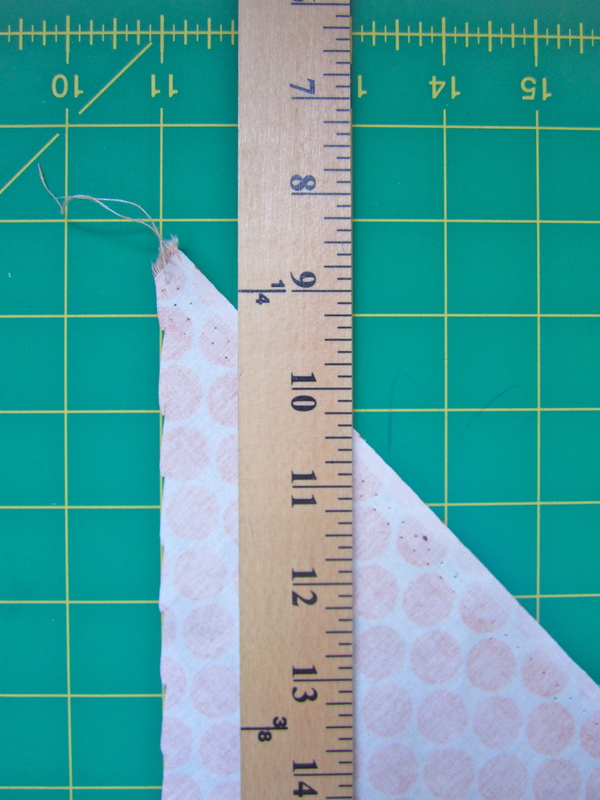 Measure 6 inches in, place your tie then lay your piece of single fold bias tape right side DOWN on top. You’ll have to open it up a bit, like in the photo below. Pin in place, and repeat for the other side too. 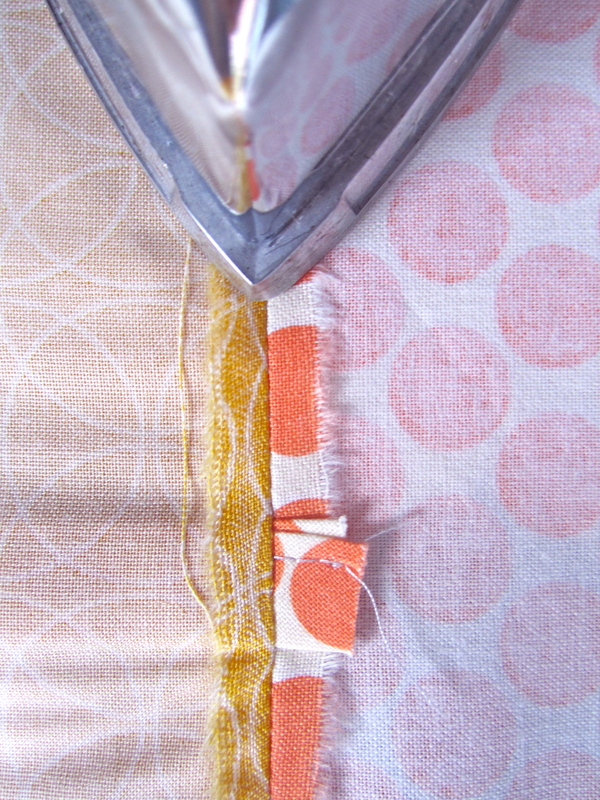 When sewing these two pieces together, it makes sense to sew along the fold that was created when you made the bias tape. It just makes for a much cleaner finish when you turn it right sides out. 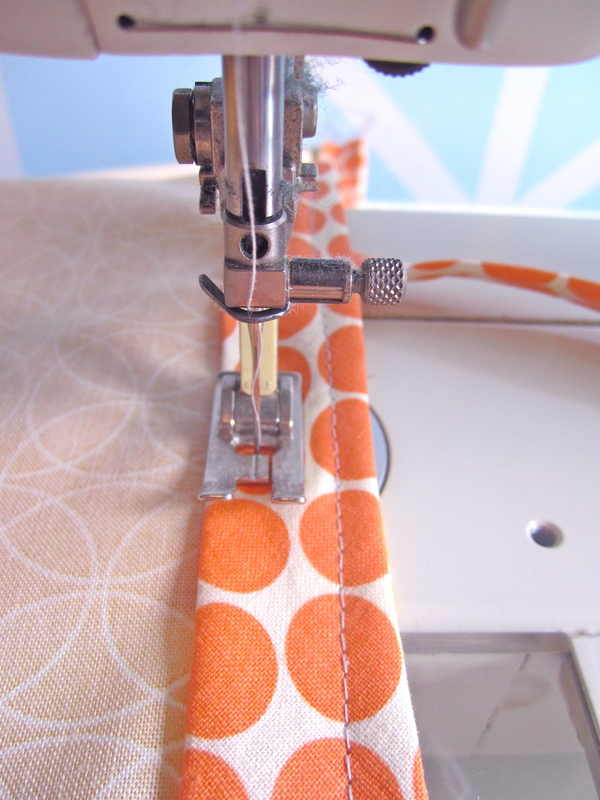 I always sew twice here for extra security. 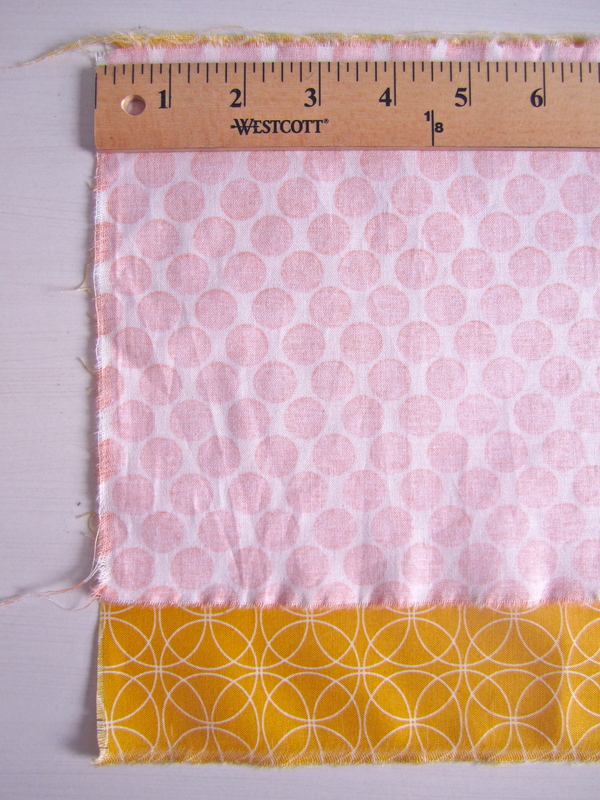 So all that’s left to do is sandwich this bad boy together to make your cushion cover complete. 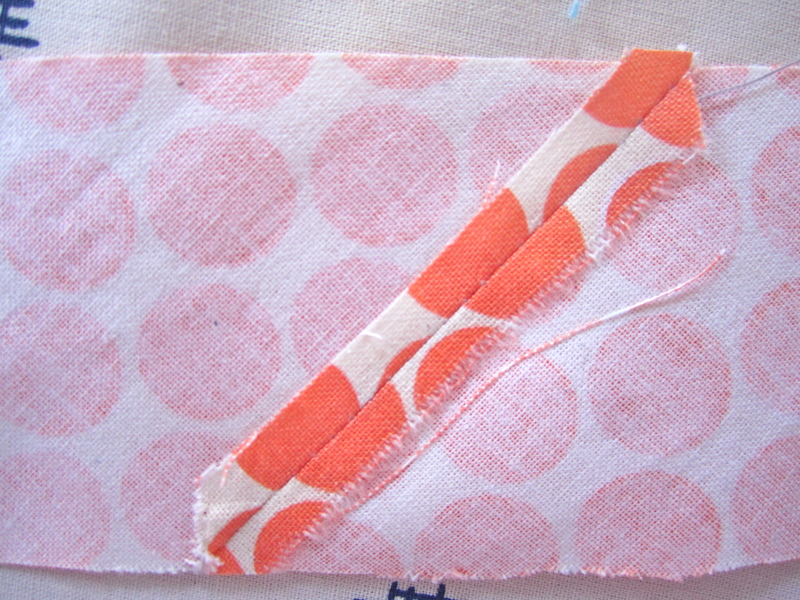 Other rectangle (with the contrasting fabric) right side DOWN. All that’s left to do is to firstly congratulate yourself for getting through this MAMMOTH post and secondly, congratulate yourself on your new cushion cover. Three cheers for you! Hip hip hooray! Hip hip hooray! Hip hip hooray! This post has taken me sooooooo long to write! Our internet is so slow and the uploading of photos is somewhat painful. Then when I lost half of the post I needed at least a day to cool off! Ha! Speaking of cooling off, yes, that would be nice. It’s been so hot these past few days 33 C/92 F on Friday/…blimey! Looks like it’s going to cool down to a pleasant 23 C/ 73 F this week though….phew! Our apartment is anything but cool and when I woke up yesterday morning to find the freezer door had been open all night and the fridge was not cooling anything, well….let’s just say I wasn’t best pleased. Anyway, onwards and upwards. It’s a new week! Let me know how you get on with those cushions and the bias tape too. Enjoy! 31 May	This entry was published on May 31, 2013 at 5:20 pm and is filed under Uncategorized. Bookmark the permalink. Follow any comments here with the RSS feed for this post. 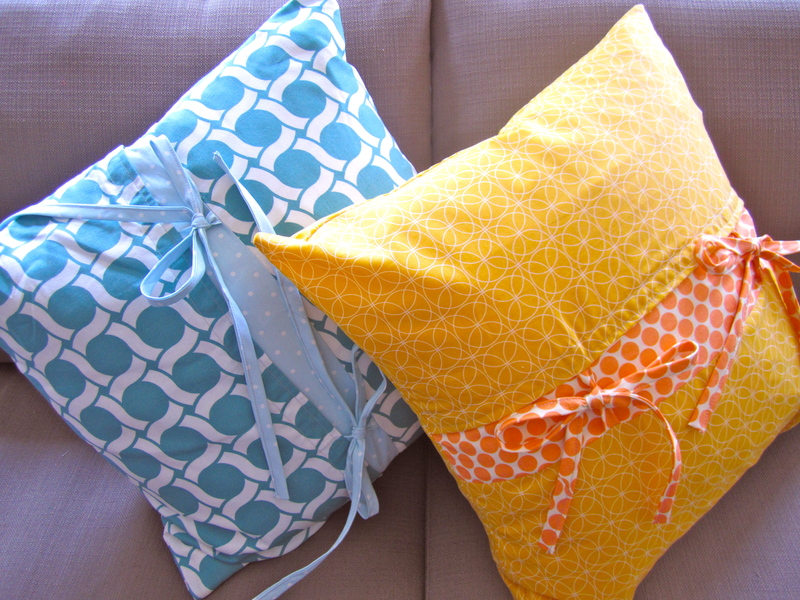 Great tuit’ Maddy, love the cushions, might just make some myself but will have to get myself a bias maker.